Learn everything you need to know about your 3 month old baby. Track important developments and milestones such as talking, walking, growth, memory & more. 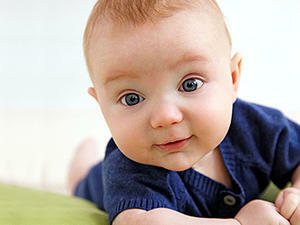 By the time your baby is 4 months old, he'll be a delight -- cuddly, cooing, quick to laugh. As his senses improve to near-adult levels, he's far more aware of the world around him and utterly engaged in everything he sees, hears, smells, and touches. Taste might be another story. At 4 months, some pediatricians recommend introducing your little one to his first taste of solid foods, usually a few tablespoons of rice cereal to supplement the formula and breast milk that remain the staple of his diet. For some babies, this opens up a wonderful realm of gustatory pleasures; for others, it's just plain yucky. Either way, work on adapting your baby to the feel of solid foods in his mouth. Chewing doesn't come naturally at first, so half the cereal will end up down the front of his onesie, but keep it up. Hopefully he'll be an eating champ in no time. Physically, your baby's day -- from tummy time to hanging out in his high chair -- offers a workout, and as a result he's getting stronger every day. By the time he's 4 months he can manage to sit upright, with a little support from you. He can bear weight on his legs and will briefly stand up if you hold him just right. He's also able to reach for objects and close them into his fists, a skill that goes perfectly with his improved ability to lift his head during tummy time. The major milestone to expect these days: rolling over. 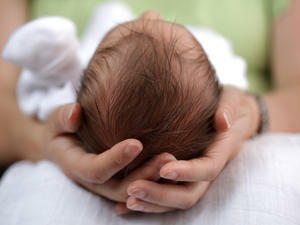 Most babies manage to flip from their bellies to their backs between 4 and 6 months. They won't master rolling the other way till closer to 6 months, so be prepared for some interim fussing till your little one can flip himself. Introducing solid foods brings on a new set of challenges, including the possibility of allergic reactions. Postpone introducing some of the most allergenic foods including egg whites, cow's milk, wheat, and peanut butter. Always watch for symptoms such as itching, redness, swelling, vomiting, constipation, diarrhea, gasping, or wheezing. Keep a log of when you introduce new foods, and let a few days pass between bringing on new baby foods. It might take a day or two for problems to rear their ugly heads, and you'll want to be able to easily pinpoint which food caused the problem. Never give rice cereal in a bottle. As appealing as a mess-free feeding method might sound, it can pose a choking hazard, and it doesn't give your baby the practice he needs to learn how to swallow and handle a spoon. Buckle your baby into his high chair or a baby seat for feedings. It's safer (and easier) than balancing him on your lap. Keep a damp rag handy to wipe off food as it falls, before it has a chance to dry on and irritate your baby's skin. Follow your pediatrician's advice for introducing other foods beyond rice cereal. Pureed bananas, applesauce, carrots, and potatoes are usually palatable and easy for little ones to digest. Use your baby's 4-month well visit soon to get advice on feeding, sleeping, and anything else that's bothering you these days. Eat better. Use that 500-calorie breastfeeding bonus to take in an extra helping of nutrients. Keep healthy snacks -- sliced apples, yogurt, nuts, whole grain crackers, and low-fat cheese -- on hand. Make sure you're drinking plenty of water too; it'll boost your milk production and keep you feeling healthy and hydrated. Reconnect with friends. Join a playgroup for face time with other moms who will have been-there, done-that advice for all your problems. And make time for old friends, whether they have children or not. Sometimes a night at the movies -- and absolutely no baby talk -- is just what you need. Help yourself. The offers of assistance have tapered off, even though you might still be feeling a little overwhelmed, so take matters into your own hands. Interview potential babysitters, sign up for a yoga class, and stock your freezer with quick-to-zap meals for days when baby demands have kept you too busy to think about cooking. Help increase her physical skills by making eye contact with her.